With reactions like that, we can’t resist organizing another trip to Europe for 2019. 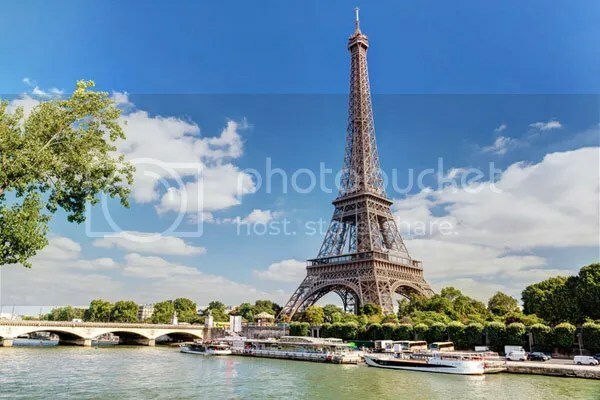 This time, the destination will be the enchanting city of Paris, the “City of Lights,” which offers many opportunities to attend great music performances, visit superb art galleries, and of course wonderful sightseeing and extraordinary vistas. Once again our European tour guides will be Rob and Barbara Seaver (Rob was born and raised in nearby Lawrence), who specialize in European tours for cultural groups. The first ten days in June 2019 offer an extraordinary opportunity to hear two of the great orchestras of Europe, the Orchestra de Paris and the Russian National Orchestra, along with the remarkable classical piano duo of Katie and Marielle Labeque. The trip will also include a concert at Versailles, visits to Giverny and the Domaine de Chantilly, and, of course, tours of great art museums including the Louvre and the Musée D’Orsay, and some spectacular sightseeing. Sunday, March 31, 2019. We will depart from Kansas City for Paris. Monday, April 1, 2019. We arrive in Paris in the morning, checking into our charming and centrally located hotel, near many of the great highlights of Paris. We will have an orientation tour of this remarkable city, including the Arc de Triomphe, the Eiffel Tower, Les Invalides, St. Germaine, Notre Dame Cathedral and several of the city’s other iconic landmarks. We will have a backstage tour of the historic Palais Garnier, the “Phantom of the Opera” opera house. This evening we will have a welcoming dinner at one of the top restaurants in Paris. Tuesday, April 2, 2019. 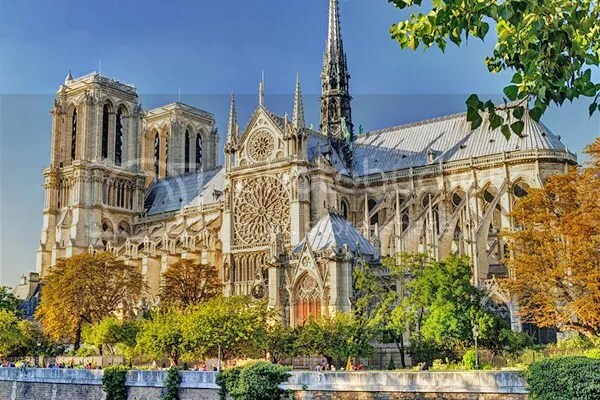 Today we will continue our Paris tour with a visit to Notre Dame Cathedral and to Sainte-Chapelle, the finest royal chapel in France, which features a truly exceptional collection of stained-glass windows. It was built in the mid-13th century on commission from King Louis IV, at the heart of the royal residence, the Palais de la Cité. 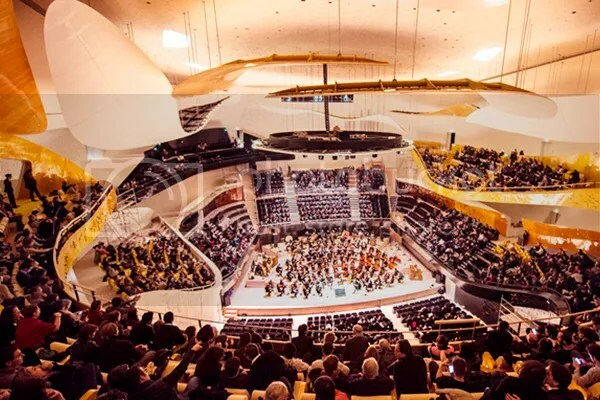 We will have a group lunch, then after enjoying a bit of free time, go to the spectacular Philharmonie de Paris concert hall to hear the Russian National Orchestra conducted by Mikhail Pletnev perform works of Mussorgsky, Rachmaninoff and Shostakovich. Wednesday, April 3, 2019. This is the day Rob Seaver will take us on the first of two visits to the Louvre (it’s just too much to absorb in one day) and enjoy many of the spectacular artworks on display there including the iconic Mona Lisa and the Venus de Milo. We will savor a group lunch at one of Paris’ fine restaurants, and then have some free time in the afternoon to explore the rest of Paris. Perhaps you would enjoy the Eiffel Tower or a visit to the Madeleine or Sacré-Cœur, two of Paris’ most famous churches. That evening we will return to the Philharmonie de Paris for a concert by the world renowned Orchestra de Paris, with Kristian Bezuidenhout in a Mozart piano concerto, and the orchestra playing Gustav Mahler’s Symphony No. 7. Thursday, April 4, 2019. In the morning we visit the Musée Guimet, the fabulous Asian art museum in Paris. After a relaxing group lunch we will tour the Tuileries Gardens and the Impressionist and post-Impressionist artworks on display at the Musée de l’Orangerie. In the evening we will go the modern opera house, the Opéra Bastille, for an optional performance of Verdi’s grand opera Otello (extra charge). Friday, April 5, 2019. Today we will return to the Louvre to see more of its outstanding collection, enjoy a group lunch, then embark on an optional relaxing boat tour along the Seine, which offers a spectacular vista of many of Paris’ scenic buildings and bridges. In the evening we will attend a duo piano recital by the famed sisters Katie and Marielle Labeque, performing a four-hand version of Ravel’s Bolero along with other works. Saturday, April 6, 2019. Today we will go to nearby Giverny, the home of Impressionist painter Claude Monet who lived and worked there from 1883 until his death in 1926. You will visit the artist’s home and the elaborate gardens featured in many of his paintings. We will have a charming group lunch in Giverny, then return to Paris for the rest of your day on your own. Sunday, April 7, 2019. This is our day to journey to the neighboring city of Versailles, made the French capital by Louis XIV, and tour the spectacular palace and its world-famous gardens. Lunch at a local restaurant is on your own. We will attend a matinee performance, a concert version of Handel’s opera Rinaldo, before returning to Paris in the evening for a group dinner. Monday, April 8, 2019. Today we will tour the Domaine de Chantilly, a spectacular and historic chateau about an hour north of Paris. After enjoying a group lunch there, we will return to Paris in time for you to enjoy some free hours before hearing the Monteverdi Choir and the English Baroque Soloists perform a concert version of Handel’s English-language oratorio Semele at the Philharmonie de Paris. If you like the Messiah, you will like Semele. Tuesday, April 9, 2019. We have saved perhaps the best for last; today we will visit the famed Musée D’Orsay and its celebrated collection of Impressionist art, including some Monet paintings based upon the gardens you visited on Saturday. You will have some free time in the afternoon before enjoying a group farewell dinner in the evening, followed by an optional performance at the Philharmonie de Paris of the chamber orchestra Les Dissonances, which notwithstanding its name will be performing the Concerto of Stravinsky and Shostakovich’s Symphony No. 11. Wednesday, April 10, 2019. We return to Kansas City, carrying with us lifetime memories of the sights and sounds of Paris. Round trip airfare between Kansas City and Paris (unless you opt to make your own travel arrangements; see note below). Nine nights of accommodations at our charming Paris hotel, centrally located near many of Paris’ attractions. Tickets to five concerts. There are two optional performances available at extra cost: Otello at the Opéra Bastille and a Les Dissonances concert at the Philharmonie de Paris. Breakfast at the hotel each day, and either a group lunch or dinner each day. All museum tickets, tour guide expenses and admission fees to all attractions. All tips and gratuities at the hotels, restaurants and elsewhere. Tax deductible contribution to the Kansas City Symphony Alliance (KCSA) once all group expenses have been reconciled. The price of this trip includes the round trip air fare to Paris. Would you prefer to make your own airline arrangements? No problem; just let us know, and we will deduct the estimated airline cost ($1,600) from the cost of your trip (deducted from the final payment). Questions? Please contact Don Dagenais, our KCSA trip leader, at (816) 444-7407 (home), (816) 665-8293 (mobile) or 816-460-5715 (office), or by e-mail at ddagenais503@gmail.com. To reserve your spot on this trip, please print and fill out the Reservation Form, and mail it with your deposit check as instructed below, for our receipt by no later than October 1, 2018. We will reserve spots on this trip on a first-come first-served basis, so please act as soon as possible. This trip is limited to a maximum of 20 people. Complete the Reservation Form and mail with your deposit to reserve your spot on this trip. Send a deposit of $1,500 per person. Please send a check made payable to “KCSA Trips” for our receipt no later than October 1, 2018. Mail the check to: KCSA Trips, c/o Don Dagenais, 5401 Brookside Blvd. No. 503, Kansas City MO 64112. We will bill you for your final payment, which will be due on December 1, 2018. Cancellation Policy. Your deposit and reservation constitute a contract for you to go on this trip. Upon receiving your deposit we will expend substantial sums to pay for your costs of this trip. If you must cancel, you will still owe the balance of the trip charge, but we will return whatever portion of your trip costs we are able to recover. You may want to purchase trip cancellation insurance to protect your investment in this trip. Please call your travel agent or check with trip insurance providers online. Change Policy. We are happy to accommodate any changes you want to make for this trip, but all change requests must be made in writing at the time of the reservation and are subject to availability and price adjustments. The tour leader must acknowledge all changes in writing for the requested changes to be confirmed.